If you are scheduling for a particular holiday destination at Costal del Sol, then Best Benalmadena Hotel is the great place for you to reside, being right in front of the beach. Hotel Mac Puerto Marina is located in the heart of the Costa del Sol, in Benalmadena, a few yards from the marina and the Puerto Marina shopping and recreational complex. 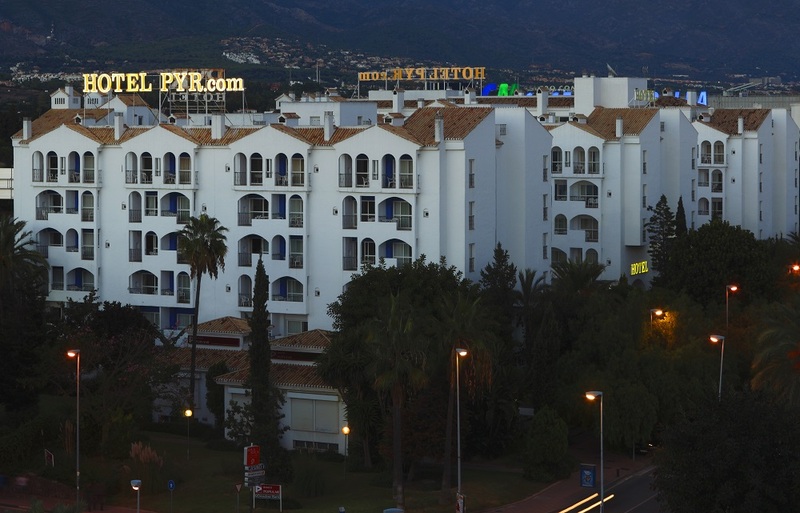 The hotel is situated in Benalmadena, Costa del Sol, next to the beach and the Torrequebrada golf course which is just a few metres away from the casino. Staying at the hotel, guests can enjoy spectacular views of the Mediterranean Sea from the terraces in the spacious apartments. The hotel offers a restaurant. A bar/lounge is on site where guests can unwind with a drink. High-speed wired and wireless Internet access is available for a surcharge. This family-friendly hotel also offers a children's pool, a terrace, and tour/ticket assistance. Parking is available onsite for a surcharge. Self catering accommodation. At the Royal Oasis Club at Pueblo Quinta, you will find the charm of the old, traditional Spanish pueblo Blanco while enjoying the best of modern beauty; Great complex for anyone looking for a self catering holiday in The Costa Del Sol. Newly refurbished in a vibrant, quirky style, this gay-friendly hotel is perfectly located for enjoying the resort's lively Nogalera district, a firm favourite with LGBT holidaymakers. With its colourful decor and fantastic facilities, the Hotel Ritual Torremolinos is the perfect pick for a chilled-out couples' break. The Hotel Club Palia Las Palomas is located in the Torremolinas area, approximately three kilometres from the town centre. The Carihuela Beach just at 200 meters from the hotel, along with many shops and restaurants along the Coastal area. This family-friendly Torremolinos hotel is located on the waterfront, within a 15-minute walk of El Saltillo Beach, Sea-Life, and La Carihuela. The hotel features 3 pools overlooking the sea. Free WiFi is available throughout. This 4 star hotel is situated on the promenade of Torremolinos, with has 70 rooms, all with free Wi-Fi, air-conditioning, terrace, satellite TV, piped music, bathroom with bathtub or shower, hairdryer, and also safe and fridge for rent.. The hotel has an outdoor pool and garden with comfortable free sunbeds for our customers. Private parking (fee). This is a seasonal hotel, open from March to October. In the heart of the Costa del Sol, one of the most cosmopolitan stretches of coastline in Spain, lies a great hotel: the Melia Costa del Sol. Perfectly located alongside the sea, with direct lift to the main shopping area. With its privileged situation, a few steps away from the beach, this hotel is ideal accommodation for those wishing to spend a relaxing summer holiday by the Mediterranean Sea, enjoying its sandy beaches and its year-round mild weather. 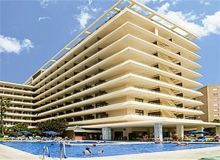 The Sol Don Pablo is ideally located next to the Bajondillo Beach in the Paseo Maritimo in Torremolinos, Malaga. The 4 star hotel has a wide a variety of facilities including two buffet restaurants, two bars, swimming pools and much more. The Hotel Pez Espada is a four-star adult only hotel with a relaxing atmosphere and an attentive personal service. The hotel contains standard rooms, club rooms and suites which are all lovely decorated in a comfortable manner. Located on the seafront, MS Amaragua overlooks the beautiful Mediterranean Sea and is close to the golden sandy beaches. The hotel contains a wide range of facilities that allow guest to relax and unwind including swimming pools, spa, sauna, massage treatments and much more. 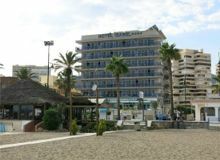 The newly-built Sol Don Marco hotel (opened June, 2004) is located alongside the sea on Playa del Bajondillo Beach in Torremolinos on the Costa del Sol. The Natali Hotel is located in the centre of Torremolinos, which is the meeting point for hundreds of tourists who are looking for peacefulness, tranquillity and comfort. 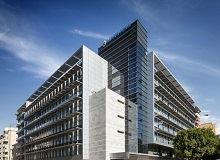 Nearby the hotel are variety of attraction including Pablo Picasso Cultural Centre, Torremolinos Beach and Aqualand. 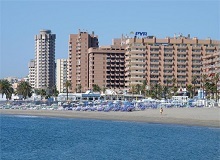 The Sol Principe hotel is situated on the promenade at Playamar in Torremolinos. The Costa del Sol is a paradise for those wanting to relax in fine restaurants and bars or soak up the sun on the beach. Las Palmeras hotel is situated in the centre of Fuengirola, by the paseo maritimo and in front of the harbour; 200 m. from the beach - This stunning hotel will offer you an unforgettable holiday in 4 star comfort. This hotel opened its doors in April 2004 and is one of the most popular hotels in the area. There is direct access on to the beach, and it is situated within easy reach of the bars, restaurants, shops and excellent nightlife. Hotel Apartamentos Pyr Fuengirola's ideal location allows guests to enjoy all the facilities that they could want for perfect holidays. They are at the heart of the seafront promenade and opposite the marina and one of the largest and most extensive beaches on the Costa del Sol. Occupying a prime beach front location, overlooking the sweeping Mediterranean coastline. This is a popular destination with families and has close transport links to Fuengirolaâ€™s shops and entertainment. Set On The Beach, this modern, Chic Hotel Has 180 Contemporary Guestrooms Feature Warm-toned Decor. All Offer furnished balconies, some with sea views. If you are just looking for a place to stay and like a good quality apartment, then try the Apartments Vegasol Playa. 1 and 2 Bedroom apartments in the fantastic Vegasol Playa community, seafront in Torreblanca, Fuengirola! Modern and new apartments, offering luxury stays with stunning sea and beach views! 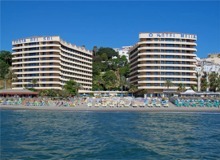 The Vincci Estrella del Mar hotel is set in an exceptional location in the heart of the Costa del Sol, in the area known as "Elviria-Las Chapas", regarded as one of the town's most desirable spots and considered to have one of the best beaches on this part of the coast. Located in the heart of the Costa del Sol at the foot of the privileged natural enclave of Sierra Blanca, the Gran Melia Don Pepe is the very best option for visiting and discovering Marbella, thanks to its excellent access to the city centre, its fabulous views & its luxurious facilities. This tranquil 4 star hotel was built in 1973 and is renowned for its traditional architecture. Located in a lively area of Marbella. The hotel offers a wide variety of facilities such as swimming pools, spa, saunas, hot tubs, sport facilities and much more for guests to enjoy. This extremely well priced has a great location in the town of Puerto Banus one of the Mediterranean's most well known marinas. The hotel is located within walking distance of the beach, shops, restaurants and night life. Turismo Tropical self catering apartments gives the smell of a typical Andalusian home with the service of a hotel in a setting of amazing beauty. With its seafront location and direct access to the beach, this is the only superior category hotel in the village of Estepona, just 1,5 km from the marina. Its comfortable rooms, terraces with sea views, elegant interior design and Despacio Spa Centre make it the perfect base for a visit to the Costa del Sol. The hotel is close to Torremolinos beach and just 700m from Puerto Marina (the marina). In addition to offering splendid views of the coast, this hotel includes a fresh water swimming pool, a solarium terrace, a games room, a bar with a terrace and the promenade of Torremolinos right behind the hotel. This property is 9 minutes walk from the beach. Set in a contemporary eco-efficient building within the port area and overlooking the sea, Ilunion Malaga offers an on-site restaurant, wellness area with indoor pool, and a fitness centre. Maria Zambrano Train Station is just 5 minutes' walk away. 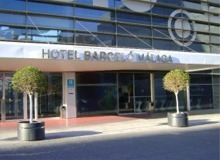 The Barcelo Malaga hotel is located in the very heart of Malaga with direct access to the Maria Zambrano train station which provides easy access to the airport. The hotel is a short distance from the main tourist spots of the Costa del Sol and is just 15 minutes from the historic old centre and is near the beach. 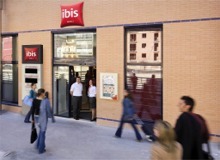 The Ibis Malaga Centro Ciudad Hotel is located at the heart of the beautiful city of Malaga and very close to the main tourist attractions, train station and just 6.2 miles (10 km) from the airport. Historical monuments such as Castillo Gibralfaro and Catedral are just 0.5 km from the hotel. 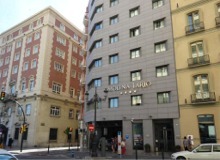 Hotel Molina Lario is located in the centre of Malaga right opposite the Cathedral and just a short distance from the port, the Picasso Museum and the citys pedestrian district. it perfect place for experiencing the Capital of the Costa del Sol, learning about its culture and tasting cuisine typical of the area.